I am Sys. Admin from 1996 along with my team seriously selling this vps for you. We are full timer. I will setup 2GB RAM, 20GB SSD windows VPS for 30 days. SSD Harddisk is 8 times more faster then HDD. Our vps is not google cloud or aws. Your vps has 30 days guaranteed. If we can't fix the problem with your vps, we will replace it with brand new one till your last minute of your contract with us . Please don't hesitate to ask! Remember, stock are limited since I am selling it outside seoclerk as well! 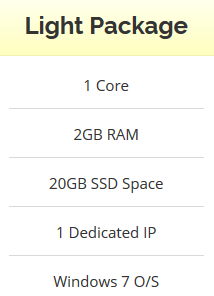 Windows VPS 2GB RAM - 20GB SSD - Anti Suspend - Unlimited Bandwidth is ranked 5 out of 5. Based on 6 user reviews.